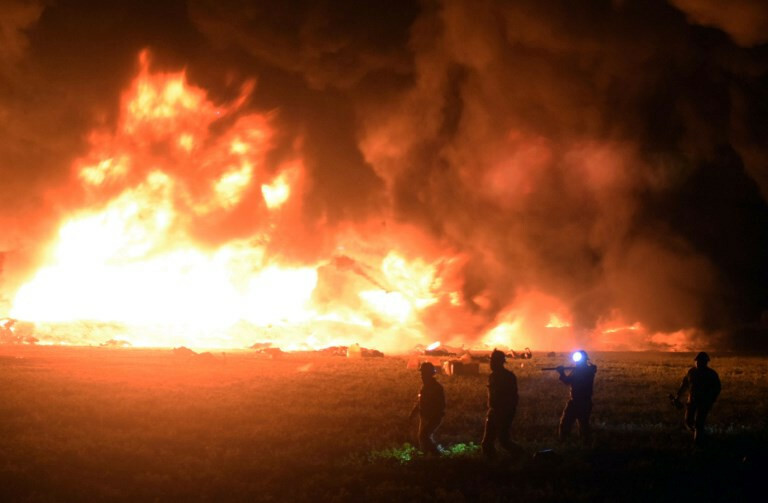 TLAHUELILPAN, Mexico– The death toll from a fiery explosion in central Mexico rose to 85 on Sunday as authorities vowed to hold accountable those responsible for a deliberate fuel-line puncture that drew hundreds of people looking to gather gasoline before it ignited. The Hidalgo state prosecutor said 54 of the dead could not be readily identified, and require DNA analysis. Mourners began arriving little by little at the home of one of the victims, while in the adjacent street a hearse carried another corpse. At a cultural center, loved ones publicly displayed pictures of the missing. "We are sick and tired of searching around in every hospital," said Moises Mejia, trying to find his missing wife Karina Ugalde and her sister Angelica. Another man, Antonio Garcia, wandered about searching for his nephew Lupillo, 17. "I don't know what he was thinking going over there," he said. "I would always see him buying his gas (at stations). I don't understand why he'd go over there to steal it." Lopez Obrador, a leftist who took office only weeks ago, traveled to the scene on Saturday. He did not fault the soldiers, saying: "The attitude of the army was correct. It is not easy to impose order on a crowd." He vowed to continue fighting the growing problem of fuel theft.